I met a very nice man at one of my art fairs this past summer. He loved my work and asked if I would speak at his camera club meeting, and share some of my pictures with everybody. This has happened before, I have gotten such requests, but people never follow through. This person did. I felt very encouraged. I put together some pictures that I could display on a laptop. The first half hour would be about what led me into nature photography, how I started my business, and what it’s like to be in art fairs. I ended with a slideshow of my shots, writing down the settings of each picture in case somebody asked. Yesterday was the day of my speech. I have a very bad sense of direction, so I was nervous about finding the place. No, I don’t have a GPS! So I relied on their instructions. As I was worrying about a turn that would be miles ahead (should I go left or right, they had said south), I didn’t realize how much speed I was gathering! My fear all went to my foot! I looked behind me and saw a cop, but it didn’t occur to me that I had anything to worry about. So engrossed was I in worrying about being there on time, and hoping I wouldn’t get lost. Well of course the cop stopped me! I was speeding, and it wasn’t just 5 or 10 over the speed limit. I told him how nervous I was and that I had to give a speech at 11am. He took pity on me and gave me the speediest speeding ticket I’ve ever gotten! And didn’t charge me the amount of money for my actual speed, but put me in the category underneath that! Thank goodness. So then I had to pull myself together. I started praying: “I surrender to the power and presence of God within me.” I said this over and over. I started feeling calmer. I actually got there 15 minutes early! It was not hard to find. And the little compass over my mirror tells me if I’m going south, west, or whatever direction I’m driving in. So there was no reason to worry. I gave a talk about my journey as an artist. I looked around at the faces. There were blank stares. I got the feeling that nobody cared what it was like to be in an art show. They just wanted to see my pictures. So, since I had only brought 7 pictures, I started the slideshow, and I made a long story about each one! Stretching it out. I had to speak for an hour in total. I tapped in to all the joy I felt when I was there. And suddenly the crowd came alive and they wanted to know how I got my hummingbird shots. How far away was I? What settings did I use on the camera? Did I shoot in burst mode? How many shots did I have to take before I got a good one. And I was able to answer all their questions in detail. And that part of the speech went really well. I ended it with a story about my skiing angel, which is another blog I’ve posted. I mentioned that I was spiritual, and this experience meant a lot to me. Blank stares. I mentioned that I wasn’t sure if I had met an angel that day. More blank stares. I started to tell the story differently by saying that I was at the top of a very big mountain in Montana, and I didn’t know how to ski very well, but somehow I got down. Suddenly people looked like they wanted me to finish this! So, it ended well with a human interest story, and I passed out a few business cards at the end, and someone took my blog printout home. As I drove home, I realized that you never know what each day brings. If you’re doing something for the first time, you’re not going to pull it off perfectly. I had learned what to discuss in future presentations. What would really interest people. What sorts of questions to expect. What information would I need to write down ahead of time, like my camera settings. And I was proud of myself. In spite of the speeding ticket, and the blank stares. I soldiered on and saw this thing through to the end. Learned from it. Made mental notes. What not to do. What to do instead. And now I’m not nervous anymore. What could be worse? Getting a speeding ticket which rattles you? And then having to perform something you’re not sure of? If I could do that, the next time will be a breeze! Right? Linda, good for you for facing your fears and getting it done! I love your mantra and will use it. Every time I read your blog or see your work I learn something. Appreciate you! Thank you Nancy. It hurts to write that check to traffic school! But i guess having this experience was worth it. Just being able to get through the day! Sometimes that’s a feat in and of itself. Thank you Wendy! Someone just ordered this picture through facebook. It made me realize I should put it on my website. It surely describes how I felt! Thank you Sonel. And I learned how important it was to tune in to the people. I’m glad I looked at their faces. It was hard to see, but I’m learning. I could see you giving speeches and making people feel good, I could totally see it! Awesome story. I’m proud of you too! Thank you for being proud of me! 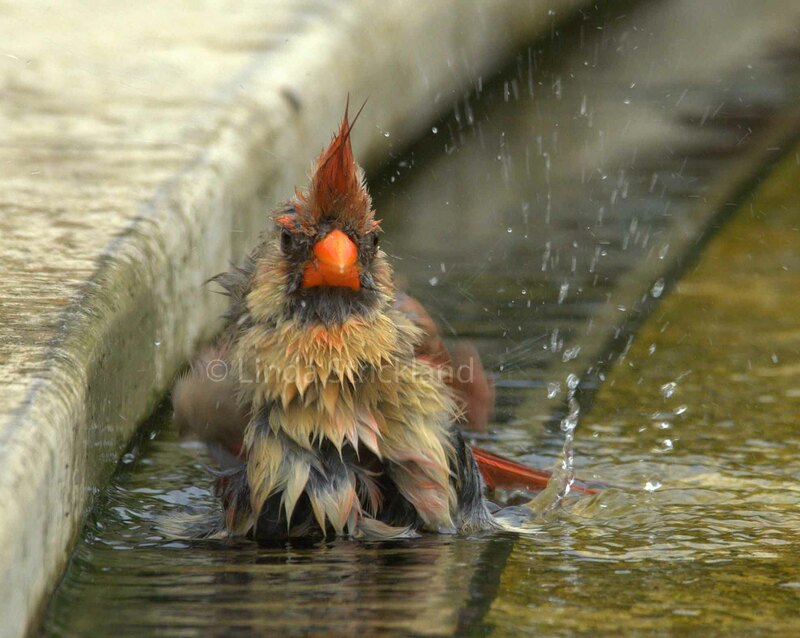 Love your photograph of the damp cardinal. Absolutely adorable! I enjoyed reading your account of your presentation as well. It reminded me of my first art talk, shared with another artist in a gallery in Paris. I hadn’t prepared any notes at all, but having my art work hanging around me in the gallery encouraged me…I felt as if I were accompanied by good friends…and the talk went really well! Thank you merma0499. I know the feeling of being surrounded by good friends, I always feel that way in my art shows. Thank you djmrakiey! I guess it was an adventure, (right up to and including the cashing of the traffic school check! -): Thanks for your kind words. I think personal stories and connection to what you are talking about seem to get the most interest regardless of whether anyone fully understands where you are coming from. Honesty is enjoyable when listening to someone speak or write. I am so glad it went well for you. Congrats! and by the way, the pic of this little wet guy is absolutely priceless! Thank you Maryse. A GPS is definitely something I need! I have sold this wet little guy a couple of times, which surprised me. So I’m adding him to my website.